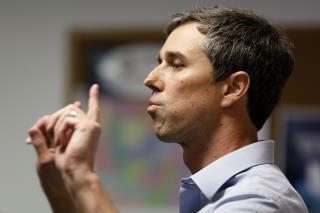 (Newser) – When he ran against Ted Cruz for the Senate, Beto O'Rourke generated a huge amount of support from grass-roots fundraising. As a presidential candidate, he appears to be starting off the same way. O'Rourke's campaign said Monday he had raised $6.1 million in the first 24 hours after his launch, edging Bernie Sanders' $5.9 million to lead all candidates, reports the New York Times. The campaign says the money came from online contributions from all 50 states and "without a dime" from PACs or corporate interests, per the AP. Official figures won't be made public until April 15.